HOUSTON, March 15, 2007 — The public is invited to explore the ancient art of Roman mosaics through a free lecture and demonstration of mosaic making techniques by fine arts professor Vincenzo Aiello of Rome, Italy. The University of St. Thomas and Our Lady of Walsingham Institutes of Catholic Culture Studies will host Professor Aiello at 7 PM on Tuesday, March 27, 2007, in Jones Hall on the University of St. Thomas campus at 3910 Yoakum, Houston. Professor Aiello will explain the history and demonstrate the techniques, practically unchanged for over 2000 years, of fitting hand-cut pieces of multicolored marble, called tessere in Italian, into a design or picture of the artist’s composition. 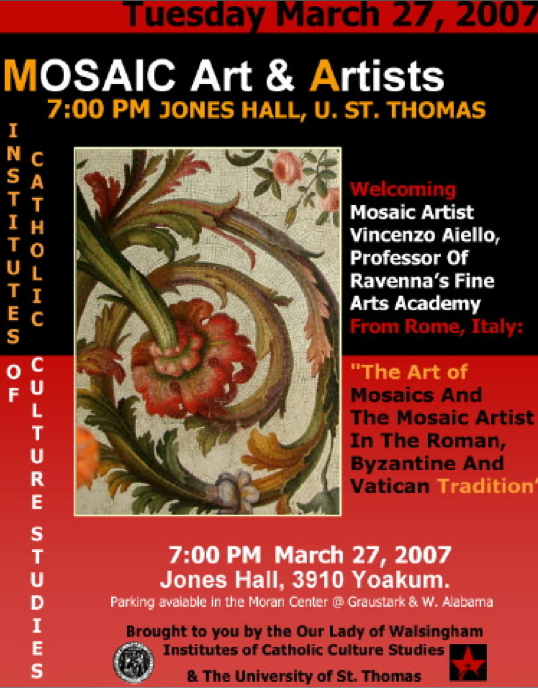 Then on Wednesday, March 28, 2007, Professor Aiello will treat the youth of the Children of the Holy House Program to an afternoon hands-on mosaics workshop in St Jude Hall at Our Lady of Walsingham Parish, 7809 Shadyvilla Lane, Houston. And during the lunch hour on Thursday, March 29, 2007, Professor Aiello will treat visitors, volunteers and staff of the Houston Museum of Natural Science to a Brown Bag Lecture on “Roman Mosaics – The Imperial Art Form Today”, including a demonstration of mosaic techniques. The event is at the Lower Level Conference Room at Noon – bring your own brown bag and enjoy this feast for the eyes. When not working on antique mosaic restoration projects, Professor Aiello teaches at the Fine Arts Academy in Ravenna, Italy, amid that city’s famous historical mosaic treasures in the basilicas and baptisteries cited on UNESCO World Heritage Lists. With over 20 years of experience as a professional mosaic artist, including time at the renowned Vatican Mosaic Studio, he also runs Studio Aiello in Rome, Italy, where he teaches and executes commissions for new mosaics of his own design for clients across Europe and the USA.